I want to say a big THANK YOU to Raoul Juneja. Over the years, he has generously connected me with numerous talented people in and out of the city. To say thank you, I wanted to feature him on the blog and speak about the charitable work that he is involved in. If Raoul looks familiar, it’s because he, alongside Dilshad Burman, previously presented V-Mix – a weekly, half-hour program that explored the fusion of South Asian and urban music. Once the show ran its course, it gave Raoul plenty of time to work on issues that are dear to his heart. Raoul has worked on a project with the United Nations to help end human trafficking and is a part of “Conquer the Fear”– an anti-bullying initiative that tours schools across Canada. To learn more about Raoul and a few of the causes he’s affiliated with, please continue to read. How did you get involved with The United Nations? Sammy Chand of the Los Angeles record label Rukus Avenue, invited me to attend an event at the United Nations last March which was tied to the human trafficking film he scored called “Sold“. The event was called ‘The Role of the Arts in Helping End Human Trafficking‘ and featured some very powerful speeches, including one by Gillian Anderson [of “The X-Files”] who also starred in “Sold”. I was shocked how unaware I was about human trafficking, and what a huge problem it is in North America. Sammy and I had supported each other’s projects for the past 10 years, but we had never directly collaborated, so we discussed teaming up to rally the global music community on an album to raise awareness and funds to fight human trafficking. 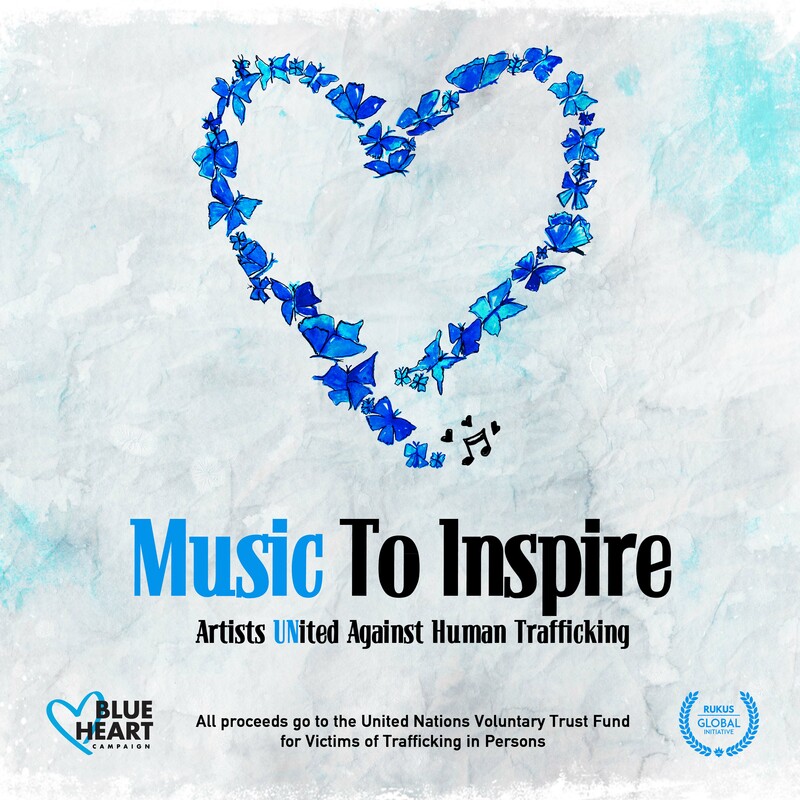 Six months later, we couldn ‘t be prouder to release a triple disc album as part of the Rukus Avenue “Music To Inspire” album series called “Artists UNited Against Human Trafficking” – featuring some of the biggest artists in the world, to benefit the United Nations Voluntary Trust Fund for Victims of Trafficking in Persons. What was the process like getting artists involved? The great thing about myself and Sammy having each worked in the music industry for 15-20 years, is that we came to the table with a wide variety of artist relationships. Of course getting major artists on board with projects still takes time, but I have to say we’re thankful every featured artist and their teams quickly realized how important the cause was. That being said, I was still star struck to get support from artists I knew but hadn’t spoken to in many years, like Tatyana Ali [‘Ashley’ from “The Fresh Prince of Bel Air”]. Then there were artists I was a fan of but hadn’t worked with in the past, who I couldn’t believe responded right away in support – like Joss Stone, Patricia Vonne and the band Garbage, to name a few. Through a combination of past relationships and new introductions, of course having A.R. Rahman, several of Quincy Jones’ artists and President Jimmy Carter on one project definitely takes the cake too! I know that you are very passionate about anti- bullying initiatives. What are some of things you are doing to address this issue? It was incredible last year touring dozens of Canadian schools as part of the “Conquer The Fear” anti-bullying team. I was alongside Alexi Couto, Shane Kippel, Jae Cabrera and Brad Ford. Having been bullied a lot when I was young, I found it very therapeutic to be able to share my story, while also showing students that you can go on to achieve great things despite what you go through in school. I’ve been lucky to also get support and present alongside several other motivational speakers in the past few years, including Corey Dixon who was the first to encourage me to become an anti-bullying speaker. Children’s author Scott Graham also invited our “Conquer The Fear” team to present at his summer camp last year, and partnered with us for several school appearances on our fall tour. I’m very excited to continue speaking at schools whenever I can. What was it like working on V-Mix? V-Mix was the best experience of my career, as I had always dreamed about creating and producing my own music TV show where I had the freedom to do on-camera interviews at my leisure. Going to work every day for 4 years at a TV studio seeing Dundas Square outside my window was exhilarating. Of course getting to interview personalities I was a fan of like Grandmaster Flash, Ashanti, and Dominic Purcell [of “Prison Break”] were once in a lifetime opportunities too! But thanks to some great mentors and co-workers, the best professional moment was when I realized in our 2nd season that I had mastered every possible aspect of producing a TV show, from first frame to last. What do you miss about the show? I definitely miss all the artists we featured and everyone who was a part of V-Mix, but especially V-Mix’s host Dilshad Burman who I worked alongside 24-7 to make our ideas a reality week after week. Fortunately we gained a friendship during V-Mix which only got stronger after the show wrapped up. It would be amazing if we get the chance to work together on something in the future! Having urban and world music artists visiting our studios is definitely something I miss as well. But not just on a personal level, more so because we constantly heard how V-Mix created a sense of community for the artists locally and internationally, that I constantly get reminded about the absence. What are some new projects that you are currently working on? I’m honoured to continue working with Rukus Avenue in Los Angeles on our “Music To Inspire” series, which included an album we also released in December for President Obama’s “Act To Change” anti-bullying initiative. Back in Canada, I’m excited to also be involved with the upcoming CUT Hip Hop Awards on May 6th, as it’s been a long time since we had a hip hop awards show in Toronto! I’ll also be returning as the keynote interviewer at the Canadian Urban Music Conference on September 2nd, and to host at TDotFest on September 3rd. Once again I would like to thank Raoul for finally taking me up on my offer and letting me share his story with others. I love that you are trying to make a difference with your philanthropic work, and balancing it out by also having an active role in Canadian music scene. Thanks for the chat!